Underworld Ascendant is meant to be a spiritual successor to 1992’s Ultima Underworld: Stygian Abyss. While that game was innovative for its time, the new game really only serves to show how modern standards have moved on. Even in a world without Skyrim or Dishonored, this lackluster title would still fail on its own merits. It offers an out-of-context and poorly-realized take on Greek mythology, weaves a boring story, and creates a glitchy game world that just doesn’t seem worth saving. Frequent crashes and long load times mean constantly staring at a black screen. Traversing through the underworld is a true test of patience, as the protagonist can’t even walk, jump, or climb properly because of poor physics programming. It’s a painful and linear journey, taking anywhere between ten and twenty hours depending on how often the game crashes and how often a mission must be abandoned because of other technical problems. Players take control of the Ascendant, a nameless and voiceless messiah who must save the world from an evil demon named Typhon. This is supposed to be achievable by collecting the Abyssal Keys scattered throughout the underworld, gaining renown from completing main story quests, and maxing out influence with the three factions by completing side bounties. However, if the doom counter reaches maximum level then Typhon escapes and it’s game over. This is something many players won’t know about until it actually happens. The doom counter randomly increases after returning to town and can only be lowered by feeding mana globes into a special machine, which in turn only drop from a specific enemy that may not always spawn. The game automatically saves when entering an area, but loading a manual save still kicks back to the entrance of the current area and resets the area, causing enemies to respawn and loss of quest progress. So if the player returns to town and gets the game over screen, it may be impossible or pointless to load an older save, an affliction suffered in the review playthrough. There are some nice views here and there. 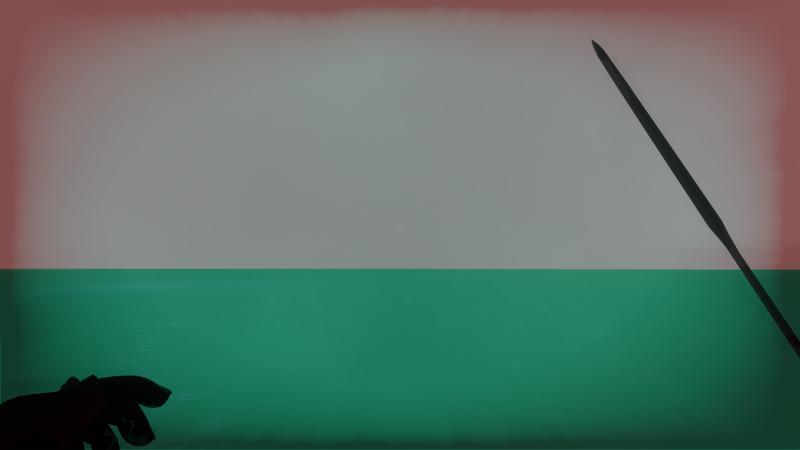 The bow is the strongest weapon, but arrows are scarce and players get penalized for using it. 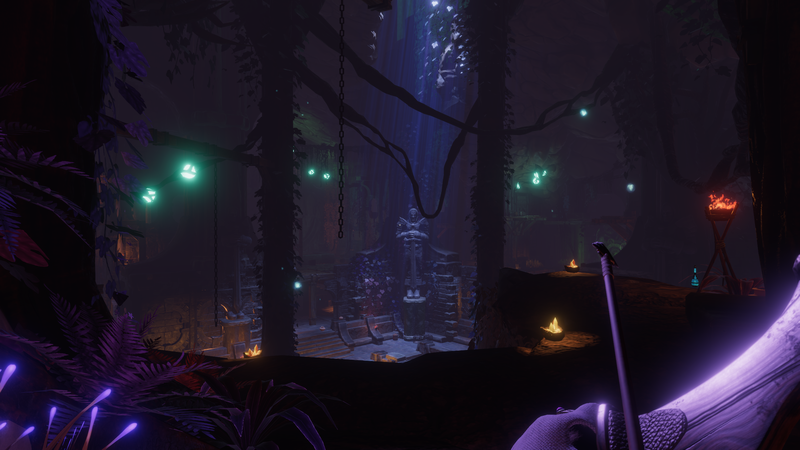 Underworld Ascendant is a mission-based game, with the player accepting one mission at a time and heading to the area that mission takes place in before returning to town after its completion. This linear format hurts the pacing, as it means returning to the same areas over and over again. The repetition and tedium is exacerbated by the fact that an area can only be escaped by completing or abandoning the mission, and there are a wealth of technical problems that can cause a mission to become impossible to complete, such as getting stuck in a wall or at the bottom of a hole, the target enemy or object simply not spawning, or the game crashing while trying to enter the portal to return to town. As noted above, if the game crashes during a mission then even loading a manual save means having to redo the whole thing. The game creates the illusion of choice with regards to character builds. The skill tree is split into separate branches for combat, magic, and stealth. Combat is difficult and magic is limited. It becomes painfully obvious early on that stealth is what the developers want. Combat can be avoided entirely for the majority of missions, unless the objective is to kill a certain enemy. Equipment degrades quickly with no means of repairing it. Even with a decent sword and the proper perks, it still takes ten to twenty hits to defeat most enemies. Meanwhile, the hero can only take three or four hits, even when equipped with better armor. Magic Fist is the only direct damage spell and it isn’t very powerful. New spells can be created by experimenting with runes, but the game doesn’t explain what the custom spells do, and using them often results in the player taking damage unless specific perks are taken to counter it. Specializing in magic doesn’t seem like a viable option. However, investing in stealth perks and using a knife makes it possible to backstab many enemies for a one-hit kill that in every other scenario requires a death-by-a-thousand-cuts approach. In the late game, with the proper perks, the player can stand right in front of enemies without being seen, or just keep performing wall runs, wall jumps, and double jumps to skip over obstacles and enemies. Dang it, I knew I shouldn’t have walked through that wall at the edge of the map. Now I’m lost in the space betwixt the pixels. There are no reliable indicators of how much damage a weapon deals or how much health enemies have, but the values appear to be variable, as enemies of the same type will appear to survive more hits than their brethren. The bow does the most damage, but using it causes the player to lose influence with one of the factions. Each mission has a side bounty, which awards the player extra money for performing certain feats, though the majority of them involve avoiding combat. Examples include completing the mission without being detected, without attacking anything, without killing anything, or without getting hit. There is no apparent attempt to tie these into regular missions, resulting in the odd scenario of players being required to kill a specific target and given the task of not killing anything at the same time. Upon completing a mission, the player is scored based on the tactics used and may earn extra money. While this does encourage the player to vary their tactics, the amount is negligible and the results have no bearing on the story or gameplay. Between traps, strong enemies, limited healing options, and the hero just randomly dropping dead for no discernible reason, death is frequent and frustrating. There are no healing potions, but the player must find and eat food. However, most of the food does nothing useful and can often poison the player. At the start of each mission, the player is given a plant item, which can be planted in any patch of dirt to create a checkpoint. This can be problematic as there are huge sections of levels composed entirely of wood or stone floors. Fortunately, the only penalty for dying is being sent back to the most recent checkpoint with no progress lost. The sound design is unmemorable, with a few NPCs who keep repeating simple phrases, while the protagonist and enemies have a limited series of grunting noises. There is no music, only ambient noise. The graphics are adequate, while the art is bland. Despite having the look and feel of a low budget Elder Scrolls game, the frame rate rarely impresses, even on low settings, while certain areas such as Tyball’s Folly become almost unplayable as they cause the frame rate to drop massively. 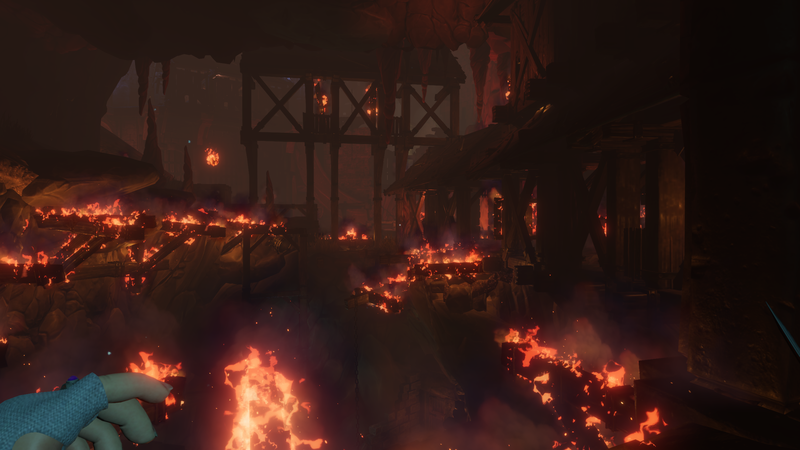 Every wooden object is flammable, and the frame rate plummets whenever there is a decent amount of fire on screen. This is problematic as there are a large number of locked wooden doors throughout the game that have no keys and must be burned. The alternatives are to beat the door with fists, which hurts the hero; beat the door with weapons, which damages them; or use magic, which takes a long time as spells use large amounts of mana that takes time to recharge. Lighting and particle effects are nice, but flickering walls, floating objects, and constant glimpses into empty space detract from whatever immersion they could have lent to the game world. Given its successful Kickstarter campaign and the few years it spent in development, Underworld Ascendant is disappointing at best. The plethora of bugs, glitches, and design flaws are simply unacceptable for a modern title. Simply put, the game seems unfinished and was likely rushed to market resulting in a horribly broken world that offers no incentive to return to it, even if future patches alleviate some of the myriad of issues. “Whoever fights monsters should see to it that in the process he does not become a monster. And if you gaze long enough into an abyss, the abyss will gaze back into you.” I gazed too long into this glitchy abyss, its malformed face gazed back, and in fighting its monsters, I too have become one. …oh my, yes they did.